This project started in December 2017 as an attempt by me to contribute to the excellent model making skills of various LJs we have here. Well that plan was soon discarded after discovering my skills were not in their league by any means. So after many years repairing Smiths Chrisps Potato the work is drawing to a close the potato handling process is to be automated somewhat and the potato crates will no longer be used. I am not fully aware of just what the changes entail but they are due to be implemented in about 18 months time. So as a form of a Thank You to the fork lift drivers who delivered the crates to me for repair over the years I decided to give them a minature model as a keepsake. The timber to the best of my knowledge is WA Jarrah or a combination of Jarrah and Red ironbark both of which are hardwoods in the “bulletproof”category, and are certainly not used for Common Pallet or Crate building this day and age. Over the years when I found out the characterstics of the wood I made many items, Boxes, minature Pallet trucks, tables, sledge hammers and plaques, just to name a few. 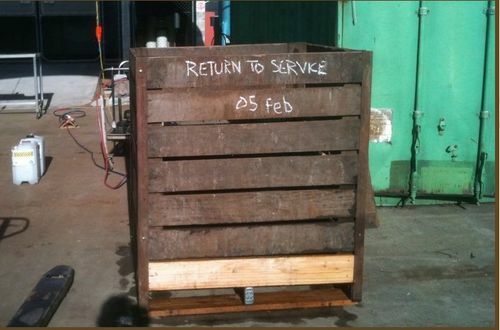 The Potato crate Models will possibly be the last project made from the Smiths scrap timber. The methodology I used and there are some “odd” practices amoungst them, has been documented as a blog series for those interested. Nice one Rob, I read the blog. Just confirming, you had a contract with Smiths crisp potato chips of repairing their crates? Anthony: To answer your question, Yes I did started around Dec 2013 and have returned about every three months since then to conduct repairs. However I was not the Original repairer !! Have a look at this early blog for a general description of the work. I still use the same steps today, ... I should take a picture of them after 5 years of dropping them in and out of the crates! Also when will you be residing at the farm? I may be doing a run to Grant’s place very soon. Also when will you be residing at the farm? I may be doing a run to Grant s place very soon. Thats a great story. Hopefully Cher and I will be on the farm early June for a week. Works getting in the way of my fun as usual. Neat job rc... but where the hell did you get those monster sized pliers? Those crates are the ideal size for crunched up chippeees. As an ex forklift driver… Ida preferred a slabba VB.. in the crate! ..... as an attempt by me to contribute to the excellent model making skills of various LJs we have here. Put a set of wheels on it and call it a Rob-by cart… a coat of shellac, some rub-on-poly and you can fool the best of us… and me as well! It looks like the real thing. Nice work! Neat and seems as if the wood was rescued from the scrap box. Rob, bad news…one less job for you. Good news…maybe you can get some of the old wood to use in future projects. Nice to be thoughtful about the fork truck guys. awesome, on the Jyagaimo (Japanese) crate ,Patatas (Tagalog) crate. Nice timber you have there and nice work on crates. Don’t ever underestimate your skills, that can only stop your progress. Excellent tribute Rob! They look very authentic! Hope you can manage to continue to do something for The company!